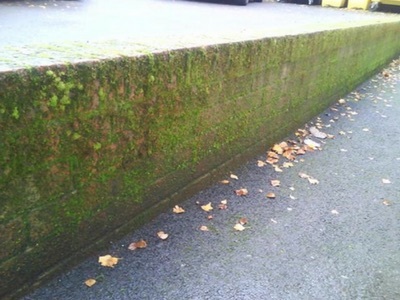 A new brick wall looks great, but within a few years moss and algae grows on them causing their once red or yellow look to go green or black. 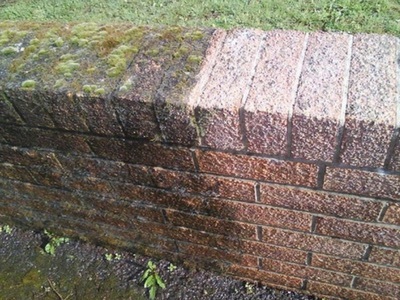 We carry out algae removal from brickwork as well cleans using different types of acids. We have many years experience and can advise our customers on the best way to carry out a clean, using the right chemical for the job. 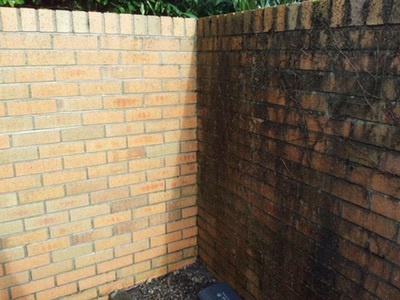 The photo shown on the right is a result of just pressure washing. We were asked to remove the chewing gum from outside a dentist in Caerphilly. Whilst we were there we were asked to clean their low brick wall. They were very pleased with the results. 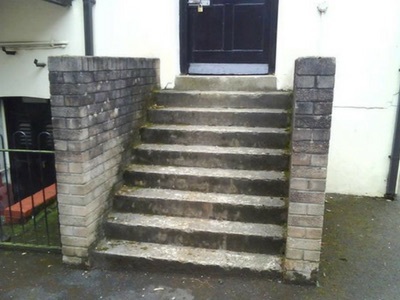 As part of a chewing gum removal job in a public school in Cardiff we were asked to clean the bricks on this little staircase. The difference between the dirty and the clean was amazing. 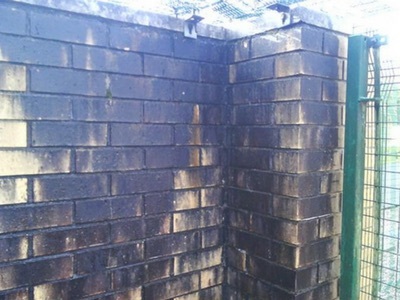 Although the second picture shows the area before it dried you can really see how effective brick cleaning by Leeksons is. We were asked to clean all the low level brickwork at the Crescent in Llandaff for a property management company. 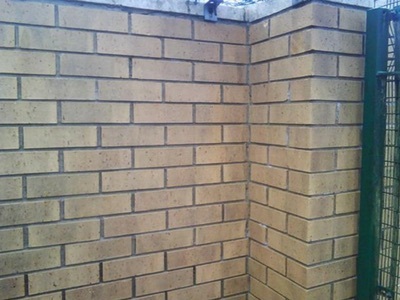 We cleaned all the brickwork and in the process removed all the ivy that was growing on the wall making it look untidy. 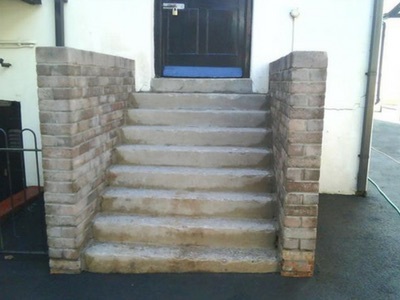 The management company was very happy with the work we carried out and several residents came out and commented on how well the area was being cleaned. 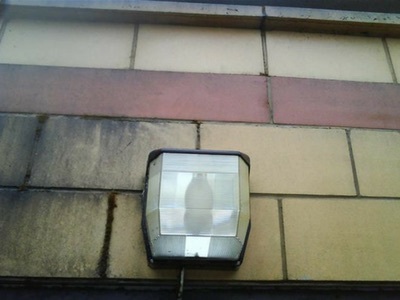 The photo shown on the right is that of a mid-clean on a dirty wall. The whole wall was black with dirt and algae. It almost looked like the wall had been painted with black paint! In a few hours we had cleaned all the walls on the property transforming the look of the whole house. The owners of the house were thrilled with the results and many of their neighbours have commented on how nice the wall looks. The stone on the right looked old, tired and dirty. This meant the whole building looked the same. In one day we managed to transform the look of the building and cleaned the moss from the painting and the aglae and dirt from the blocks. 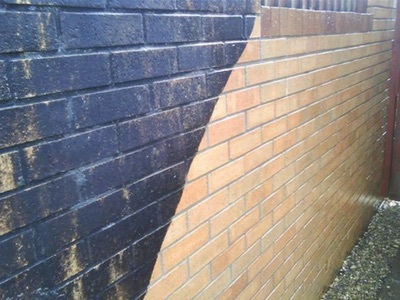 The walls in the picture below show a before and after shot of a brick clean. 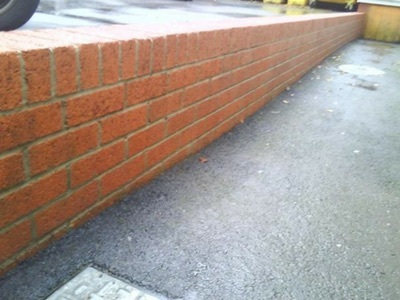 We were asked to clean all the brick work on site and the owners were very happy with the results. The moss on this wall almost looks like the wall had fur! We were called to the site to clean the wall. We managed to clean the whole wall and a few other items with the water that we brought to the job in our on board 500 litre tank. The customer has reccomended us to several of his customers and friends.